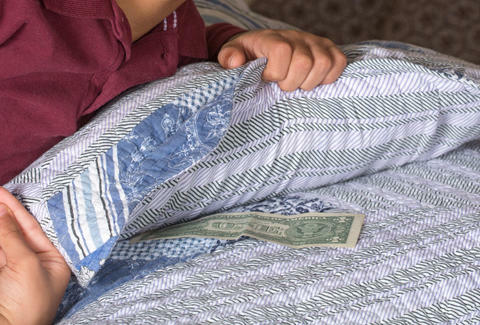 Don't freak out, but Tooth Fairy payments dropped by 11% in 2017. That's according to The Original Tooth Fairy Poll, which not only exists but has been gathering data from parents on the important issue of Tooth Fairy payments since 1998. Part of the reason they do this is to study whether changes in the economy have any impact on this niche form of giving. And it turns out that it generally does. For 12 of the past 14 years the trend in average tooth-loss giving has tracked with the movement of the S&P 500. But last year was an exception. The S&P 500 gained close to 18%, and the Tooth Fairy dropped her giving rate anyway. According to the Original Tooth Fairy Poll's Tooth Fairy Index, roughly $4.50 per lost tooth was paid out in 2016. In 2017 that plummeted to about $4.13, a devastating drop of 53 cents. It's interesting to note, however, that for a first lost tooth the drop was more modest: In 2016 a first tooth ran roughly $5.72; in 2017 that was down 2 cents to $5.70. All told, the Tooth Fairy invested $271 million in our youth in 2017. Apparently kids in the West had it best, with an average of $4.85 per tooth. That's followed by $4.35 in the Northeast; $4.12 in the South; and $3.44 for the unfortunate Midwestern youths. Some poor souls even had parents who weren't interested in furnishing cash to children. Apparently 47% of parents who answered the survey left a small game or toy, 35% left a letter, and 31% left a toothbrush. James Chrisman is a News Writer at Thrillist who is starting to think losing teeth isn't a bad racket to get into. Send news tips to news@thrillist.com and follow him on Twitter @james_chrisman2.